We cannot believe a year has passed already since our first Lively Up! Festival and here we are, presenting our second festival. Two new works are premiered in this year’s festival, both celebrating the life and work of the civil rights activist, Dr Martin Luther King Jr.
Music, poetry and the moving image combine in a major, exhilarating concert by Mercury/MOBO award-winning saxophonist, Denys Baptiste to mark the 50th Anniversary of Dr Martin Luther King’s historic ‘I Have A Dream’ oration. One of the civil rights movement’s most conspicuous and influential leaders, Dr King insisted on freedom, justice and equality for all. Inspired by this momentous speech, Baptiste penned what is now widely regarded as a modern day classic, Let Freedom Ring! – an evocative four-part suite that garnered critical acclaim and standing ovations the world over when it toured in 2003. In 2013, he reprises Let Freedom Ring! 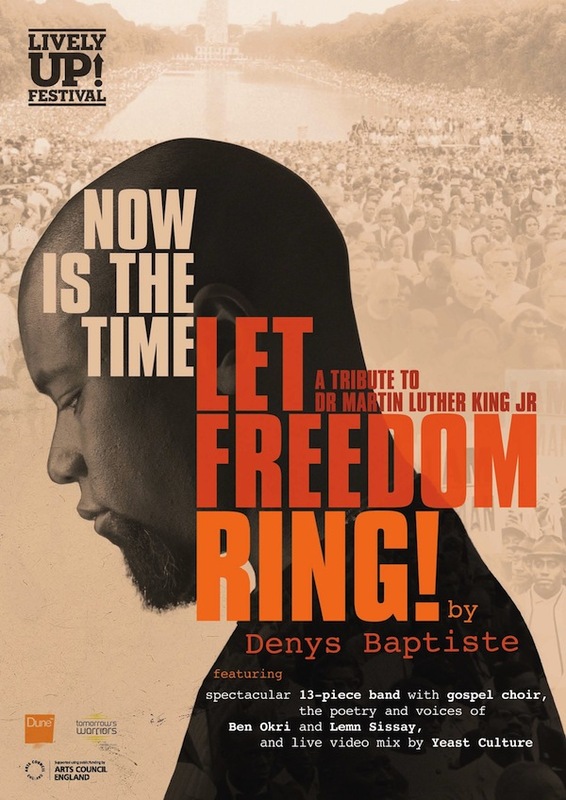 alongside an entirely new suite, Now Is The Time founded upon the rhythmic patterns of Dr King’s speech. A thought-provoking yet utterly uplifting show combining jazz and blues with rousing gospel singing, Afrobeat and Afro-Cuban rhythms, inspirational poetry and live video mix. This is an extraordinary live music experience you won’t want to miss! Lively Up! 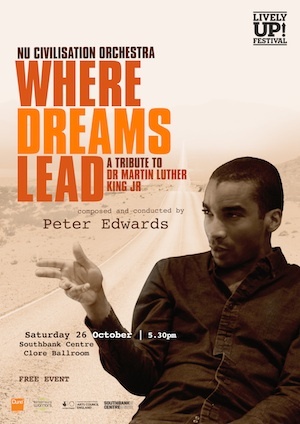 Festival is also proud to commission and premiere Where Dreams Lead – a new suite by pianist, composer and arranger, Peter Edwards for the acclaimed Nu Civilisation Orchestra (NCO) inspired by the legacy of Martin Luther King. Brainchild of our festival curator, Gary Crosby OBE, and a resident project at Southbank Centre, this world-class orchestra provides a platform for Crosby’s most talented protégés. The NCO is passionate about enabling young composers and conductors explore new territory and collaborate across art forms, so that audiences remain curious and excited about where their next NCO experience might take them. The Orchestra relishes the opportunity to delve into the rich archive of enduring classics crafted by some of the greatest composers that have ever lived, and to create new work in homage to its heroines and heroes. So, though Lively Up! Festival is much more compact this year, it is just as exciting and packed with great music as last year! Enjoy!